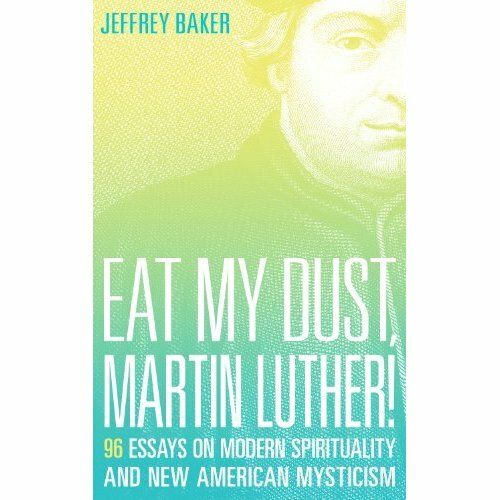 After my own bookish call for celebration, I would like to draw attention to another book in a kindred spirit, namely Jeffrey Baker's Eat my Dust, Martin Luther! 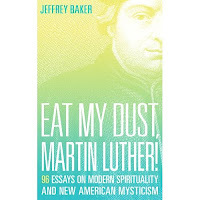 which comprises 96 essays on American mysticism, beating Luther's originally posted bullets by one. When I was approached for a book review, I initially felt both reluctant (what if I have nothing good to say about it and hence waste all our collective time, energy and resources) and curious (Martin Luther, warts and all, I like, mysticism I like too, but how to feel about dust?). It turned out that Baker does not only share my philosophy (or rather I his) but that we use the panacea of humor to give our worldview an amusingly absurd twist around the ears. There are parts of this book that made me smile although I wanted to laugh, but in certain situations (especially an exam invigilation) laughter may not be the most appropriate reaction. I will share my favorite bit in which Baker muses about a strictly amateurish tongue-in-cheek hobbyhorse of mine: astrophysics. He says that no matter how easy the scientific texts are made for us lay people (astrophysics for astrodummies) that he (and I for that matter) always get lost the moment the apple hit Newton's head! But it is not all fun and games as under his (collectively our) fool-cap there is (or so we like to think collectively) wisdom at the heart of the matter or the end of the road or sentence. I will give you a few themes of his essay collection by categorically spoiling the entire book for you (it is a joke, of course, not the book but the spoiling part). There is a very Buddhist flair to the difference between finite self and infinite Self, to this notion of a limited ego that craves attention and fights for survival, the baser and more animal instincts of ours versus the endless, immortal self or soul that transcends time and space and is mainly concerned with cosmic health and well-being. What I liked here is Baker's definition or understanding that evil may occur due to, evolutionary speaking, reasons of survival. That, for instance, racism is a way of trying to forge a more superior group and bond by eliminating others (Nazism or fundamental religion may come to mind). Although such ideas are inherently sick, demented to downright vicious, Baker sheds some light onto its motivations and causes, namely a (Socratic) type of misleading ignorance in addition to a misreading of the world. This lack of knowledge (empathy / awareness) is the source of a lot of mayhem, war and destruction. Furthermore, Baker claims that those who are very insecure and overly sensitive to criticism try desperately to protect themselves under the layers of armor containing excessive pride. This often leads to a cutting-off from others, inflates the limited survival-oriented little ego to grasp onto false and empty straws, which eventually causes much more damage than good to all involved. On the other hand, those who are humble (humility next to honesty being one of my favorite characteristics at least blogging-wise) will have a much harder time to convince the goal-oriented rest of society that their path will bring the most benefits. Finally, since the infinite self is so much more resourceful, not to mention blissful than anything else in the world (universe, cosmos), we would strongly benefit from tapping or plugging into it. In sum, I have thoroughly enjoyed the wit, wisdom and honesty of this book and recommend it, qualms aside, to my dear readers as an alternative or substitute to Arash's World. Chapeau, Mr. Baker, and the next round's on you!